Daniel Yergin’s first prize-winning book, Shattered Peace, was a history of the Cold War. Afterwards the young academic star joined the energy project of the Harvard Business School and wrote the best-seller Energy Future. 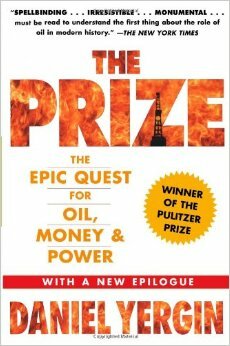 Following on from there, The Prize, winner of the 1992 Pulitzer Prize for nonfiction, is a comprehensive history of one of the commodities that powers the world–oil. Founded in the 19th century, the oil industry began producing kerosene for lamps and progressed to gasoline. Huge personal fortunes arose from it, and whole nations sprung out of the power politics of the oil wells. Yergin’s fascinating account sweeps from early robber barons like John D. Rockefeller, to the oil crisis of the 1970s, through to the Gulf War. Energy consultant Yergin limns oil’s central role in most of the wars and many international crises of the 20th century. “A timely, information-packed, authoritative history of the petroleum industry, tracing its ramifications, national and geopolitical, to the present day,” said PW. Photos. Author tour. This book does not require recent events in the Persian Gulf to make it an essential addition for most public libraries as well as all college libraries. Written by one of the foremost U.S. authorities on energy, it is a major work in the field, replete with enough insight to satisfy the scholar and sufficient concern with the drama and colorful personalities in the history of oil to capture the interest of the general public. Though lengthy, the book never drags in developing its themes: the relationship of oil to the rise of modern capitalism; the intertwining relations between oil, politics, and international power; and the relationship between oil and society in what Yergin calls today’s age of “Hydrocarbon Man.” Parts of the story have been told as authoritatively before, e.g., in Irvine Anderson’s Aramco: The United States and Saudi Arabia ( LJ 7/81), but never in as comprehensive a fashion as here. – Joseph R. Rudolph Jr., Towson State Univ., Md. 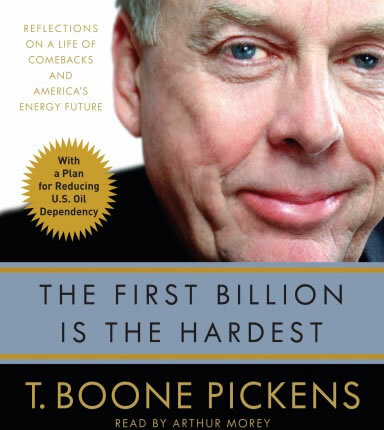 Now eighty years old, T. Boone Pickens is a legendary figure in the business world. Known as the “Oracle of Oil” because of his uncanny ability to predict the direction of fuel prices, he built Mesa Petroleum, one of the largest independent oil companies in the United States, from a $2,500 investment. In the 1980s, Pickens became a household name when he executed a series of unsolicited buyout bids for undervalued oil companies, in the process reinventing the notion of shareholders’ rights. Even his failures were successful in that they forced risk-averse managers to reconsider the way they did business. When Pickens left Mesa at age sixty-eight after a spectacular downward spiral in the company’s profits, many counted him out. Indeed, what followed for him was a painful divorce, clinical depression, a temporary inability to predict the movement of energy prices, and the loss of 90 percent of his investing capital. But Pickens was far from out. From that personal and professional nadir, Pickens staged one of the most impressive comebacks in the industry, turning his investment fund’s remaining $3 million into $8 billion in profit in just a few years. That made him, at age seventy-seven, the world’s second-highest-paid hedge fund manager. But he wasn’t done yet. Today, Pickens is making some of the world’s most colossal energy bets. If he has his way, most of America’s cars will eventually run on natural gas, and vast swaths of the nation’s prairie land will become places where wind can be harnessed for power generation. Currently no less bold than he was decades ago when he single-handedly transformed America’s oil industry, Pickens is staking billions on the conviction that he knows what’s coming. In this book, he spells out that future in detail, not only presenting a comprehensive plan for American energy independence but also providing a fascinating glimpse into key resources such as water—yet another area where he is putting billions on the line. From a businessman who is extraordinarily humble yet is considered one of the world’s most visionary, The First Billion Is the Hardest is both a riveting account of a life spent pulling off improbable triumphs and a report back from the front of the global energy and natural-resource wars—of vital interest to anyone who has a stake in America’s future.